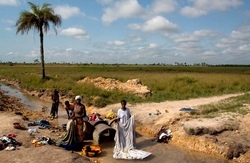 In light of the prevailing rapid and large-scale takeover of farmland in Sierra Leone, where the majority of the population are small scale farmers living in small rural communities, vast areas are possessed by the inhabitants of these communities, which they are at present leasing out to mining companies for mining and mineral exploration. Apart from leasing to mining companies, these huge land masses are being leased to new economic entrepreneurs in the name of agricultural investment with a high potential to accelerate development. This is made against the background of claims that just 11 to 15 percent of the country’s arable land is being used, and that there are plenty of extra land available for foreign investors to develop. This view contradicts research findings which conclude that, “there is in fact, already pressure for arable land in Sierra Leone and there is no idle productive land that could easily be made available for commercial agriculture under the current patterns of small holder upland cultivation and fallow rotation”.